In support of our Belief that every individual has a social responsibility to make the world a better place, Payscout serves as a Champion with the Jefferson Award Foundation (JAF), the nation’s most prestigious and longest-standing organization dedicated to inspiring and celebrating public service. Each Champion organization is given the opportunity to select one employee as its outstanding employee volunteer of the year. 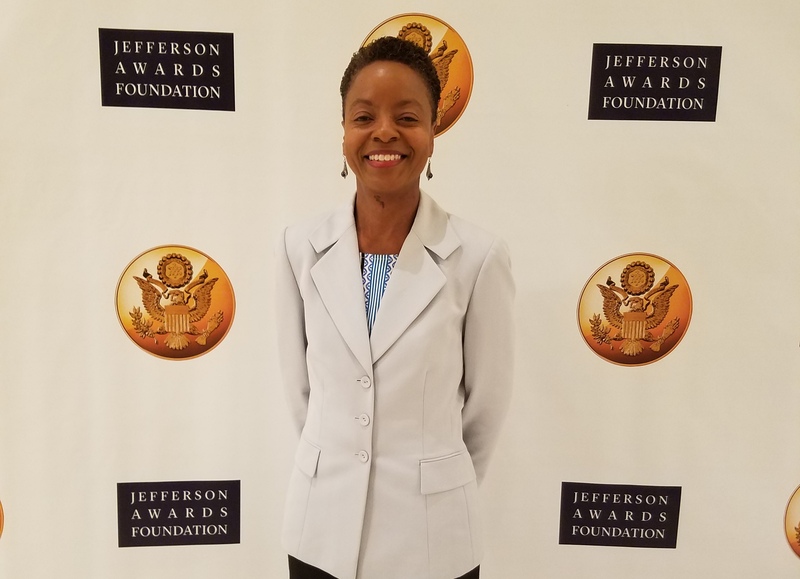 This year, Erica Boatman-Dixon was selected for her volunteer efforts, which include organizing activities for Students in Action at Van Nuys Middle School and working on Lead 360 activations and overall support of the Greater Los Angeles JAF team. As a reward for being selected as the employee volunteer of the year, Erica had the opportunity to travel to Washington, DC, to attend the annual JAF National Ceremony, the gathering of national leaders, grassroots heroes, and Students in Action Teams to celebrate the best of public service in America. The National Ceremony activities took place from June 27 through June 29 and provided an opportunity to connect with other JAF Champion award recipients, community and celebrity award recipients, Students In Action teams and media partner award recipients. Recipients were given the opportunity to take a tour of many of the historical monuments in the National Mall on Wednesday evening to get to know one another. On Thursday morning a Welcome Breakfast was held giving each award recipient the opportunity to address attendees and share their story. “There were numerous stories of triumph over tragedy and how loss compelled people to give back to the community,” said Erica. “We need a Welcome Breakfast like this every day,” she added. During the afternoon recipients had a chance to visit their Senator or Representative. The California contingent visiting the offices of Senators Kamala Harris and Dianne Feinstein included: the Greater Los Angeles SIA competition winning student team from Sage Oak and the students from the Convent & Stuart Hall Schools of the Sacred Heart in San Francisco, JAF Greater Los Angeles Executive Director Myla Rahman, San Francisco Program Manager Kim Bonney, and two award recipients from San Francisco, recognized for their efforts for assisting homeless women sleeping in their vehicles in Monterey and providing gifts for less fortunate children during the holiday season. Though Ms. Harris and Ms. Feinstein were unable to attend the meetings, the opportunity to share information about community outreach efforts with representatives from each Senator’s office was exciting for all involved. For more information on the Jefferson Awards Foundation and how you can get involved, visit jeffersonawards.org. Congratulations to Erica, the students from Sage Oak, and all award recipients. Payscout will continue to #CelebrateGood with the Jefferson Awards Foundation and other organizations that make the world a better place. Follow our blog for more Payscout Gives employee engagement and activities. 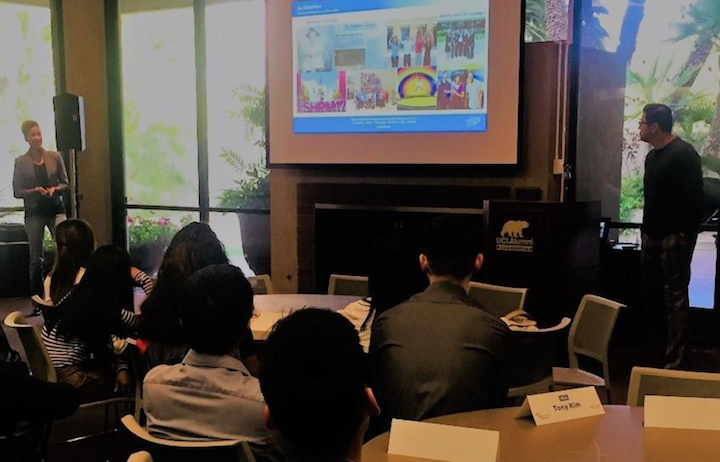 On May 21, Payscout People Operations Generalist Ebony McKnight PHR, SHRM-CP spoke at the Partnership UCLA Bruin Development Academy to students on, “How to Differentiate Yourself as a Candidate.” She was joined in the presentation by Payscout COO (and UCLA alum) Juan Sotelo. The two spoke to UCLA students in the Banking & Finance session of the Bruin Development Academy, a course that covered strategies for success and skills mastery providing students the practical skillset to obtain a job in the banking and finance industries. This was not the first time Ms. McKnight has shared insights on how to optimize one’s candidacy and land a dream job. The Human Resources subject-matter-expert regularly publishes inspirational posts on her LinkedIn account that are intended to help others find their personal passion, turn that passion into a profession, and lead the life they have always wanted. This example of thought-leadership not only benefits the students who heard her story, it also aligns with Payscout’s Belief that every individual has a social responsibility to make the world a better place. Yet another member of the Payscout team is leading by example and demonstrating what it means to give back. Way to go, Ebony!